We love to reward our loyal customers, and what better way than through Regal Dry Cleaner’s Express Membership Club. What’s on offer as an Express Club Member? 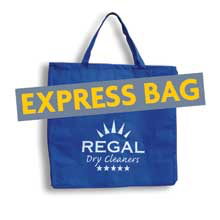 Free personalized Regal Dry Cleaners blue carry bag. For a faster service 'jump the queue' experience DROP & GO. BENEFITS – use our driveway service (selected stores only) DROP & GO. We retain your credit card details in a secure manner, DROP & GO we take care the rest. •	Receive an SMS when your dry cleaning is ready for pickup. Free personalised Regal Dry Cleaners blue carry bag. Prepayment at the service counter. Receive an SMS when your dry cleaning is ready for pickup. Simply fill out the online form below, submit and pay the one-off $10 fee in store (fee is waived if you’re already a regular customer). Already a member? Login here and you can update from an Express Member to Expresss Club Member in your profile and your preferred store will be notified.